The night before Christie’s auction on May 14 was Sotheby’s sale of contemporary art. 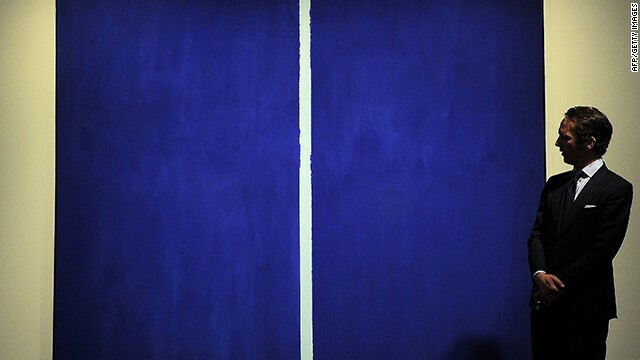 The featured work was Barnett Newman’s "Onement VI." The final price tag: $43.8 million. [2:35] "It's the condition, it's the look, it's how it fits into the artist's career. But then it's the history – the ownership history, the exhibition history. A painting that's been exhibited in a lot of museum shows, that gives it significance over similar paintings." [5:05] "Don't spend more than you should be because you're trying to convince yourself it's going to be a great investment, you're going to get a great return and you're going to send a kid to college on it. Because that may not happen." If you choose to play, it's a game in which you have to know what you're doing, according to art journalist Abigail Esman. So instead of buying art purely to make a profit, Esman who also collects art herself, says you have to be in love with the piece. [5:41] "If you love it, buy it. If you choose well, one day you'll be able to sell it for a profit, and if you choose very well you probably won't want to." This is an absolute Eye-Opening experience for me as an Artist as well as an Art Collector. The Painting itself was not impressive to me but the comentary by the experts and how they view it was. The way an untrained eye would look at art verses the trained eye. It would be lovely if people would start investing money into Art that they like and Art that moves them. Being surrounded by Art is good for the soul and buying it is the best way of keeping us Artists happily employed in the profession we love.